Wool is a science-fiction novel that takes place in a post-apocalyptic future where people have been forced to live in a large underground silo hundreds of stories below the earth in order to survive in a world where the air is now toxic. It is part 1 of a trilogy with Shift and Dust being the 2nd & 3rd books. I know the focus of my blog is movies but I do occasionally read a book. 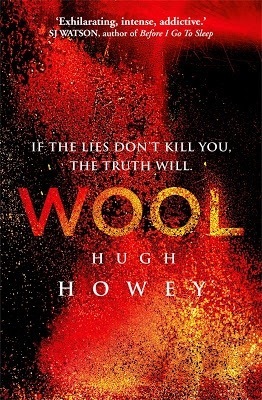 😉 So to get your attention, I’ll say the film rights for Wool have been snatched up by 20th Century Fox and the person most-rumored to direct is Ridley Scott and to write the script is Steve Zaillian. I can’t find any up-to-date official information (IMDB currently lists J Blakeson as director but there’s zero other info) but Ridley Scott is the name most mentioned and would be an excellent choice for this dystopian tale. So hopefully I have your attention now. I think this book is certainly worthy of being made into a film by the director of Alien & Blade Runner. Odds were pretty good that I’d like this book as I’m a sucker for all things apocalyptic and/or dystopian. I should maybe see someone about that… Anyway, Wool surpassed my expectations. Wool starts out early on with a “cleaning”. The people living in the silo are forced to follow strict rules & regulations. The population numbers are controlled through a lottery. Those with curious minds are considered dangerous and are closely watched. The survivors in the solo have survived for many generations and very little is known of how and especially why they are living in this silo. They are simply told that the outside world is dangerous and to even talk about it (and especially to express an interest in it) can lead to the punishment of “cleaning”. Those who are sent to cleaning literally do just that – they are given a protective suit to allow them long enough to be sent outside & clean the silo’s camera lenses, which offer a view of the outside world through a large screen in the uppermost floor of the silo. The person sent to cleaning then dies as the toxic air eats through their suit. The days following a cleaning are a celebration of sorts, in which those living in the deeper levels of the silo will try to make the days-long trek to the top level to get the temporarily clearer view of the outside world. Wool does start out a little slow as the characters of the silo’s mayor, sheriff, and deputy are developed. Howey does a great job fleshing out these characters and making you care about them and want to know more about them. I’ll never complain about time spent on character development – that’s very important to me in a novel. For those wanting to get to the action, though, they may be a little disappointed that it takes quite a while to get there. It also takes a long time to finally be introduced to the novel’s main character, Juliette, who works in Mechanical in the deepest depths of the silo and who they wish to recruit to come & work “at the top” as the deputy was very impressed with her when she helped them out once in the past. A fascinating book exploring a very possible & frightening future for humanity if we don’t shape the hell up. But how did the characters end up living in this underground silo? That’s not yet answered but I’m assuming all will be revealed in the further two books (the second one, Shift, is a prequel and the third one, Dust, picks up where Wool left off). As far as I know, anyway – I’m not reading too much about them yet in order to avoid spoilers as I’ll definitely be reading them both. Wool does stand well on its own, however, with a satisfying conclusion for those who may be worried at an abrupt ending as there’s a further book. I highly recommend the book and really do hope they make a film out of it – With the right people involved, it could be a great one. I’ve added this to my to read list. Heard so many good thing! Have you read The Hunger Games? They’re calling this “the next Hunger Games”. I can see why, although Wool isn’t Young Adult. Yup. I have. Definitely checking it out then. I really did enjoy it. 🙂 I’m hoping they do things right & make a really good movie out of it. Have you read The Hunger Games (Mockinjay) trilogy? This reminds me of it a bit. But sounds good anyhow. And I liked HG, so it’s not a bad thing. Frightening future? This is already how they live in Bayonne, NJ! …JERSEY RULES! I’m echoing the last person’s thought that at first, I pictured the Hunger Games’ dystopia controlled by a corrupt government. I do not echo that person’s enjoyment of Hunger Games though. I thought that was a bland, unoriginal series of shlock that got worse as every book emerged. So if you read HG, how does Wool compare? BTW, I wrote this whole thing on an iPad. Appreciate how challenging that is. Well, then – I think you’ll want to stay away from Wool… Lol! They’re calling it the “next Hunger Games”. It does have a very similar feel, although it’s not Young Adult. I loved The Hunger Games. 😉 But agree they went downhill (the final one was the worst. But I really liked the first one a lot). It’s so good. I read tons but I find book reviews harder to write though this was the first one I did. Are you going straight on to the next book in the trilogy?